Author(s): Alberta Lucchese. Multidisciplinary Department of Medical-Surgical and Odontostomatological Specialties, Second University of Naples (SUN), Via L. De Crecchio, 6, 80138, Napoli. Oral cancer (OC) is a common and aggressive cancer with poor survival rate. Recent research has investigated in detail the complex network of chemical, viral, and (epi)genetic factors associated with oral carcinogenesis. However, the causal factors that trigger the oral carcinogenesis process and the molecular mechanisms that underlie the tumor progression, and metastasis of OC have not been clarified. The present study analyses the hypothesis that immune reactions following viral infections may crossreact with tumor suppressor action proteins involved in OC. Using proteome databases and epitope catalogue resources together with data derived from an ample scientific-clinical literature, potential peptide crossreactions between HCV, HPV16, EBV, and CMV pathogens and human p53 and CSMD tumor suppressor proteins are detailed. The present study might contribute to understand the molecular basis of oral carcinogenesis and open new therapeutic research perspectives. Keywords: Epitopes, oral cancer, peptide crossreactivity, tumor suppressor proteins, viruses. Affiliation:Multidisciplinary Department of Medical-Surgical and Odontostomatological Specialties, Second University of Naples (SUN), Via L. De Crecchio, 6, 80138, Napoli. Keywords:Epitopes, oral cancer, peptide crossreactivity, tumor suppressor proteins, viruses. Abstract:Oral cancer (OC) is a common and aggressive cancer with poor survival rate. Recent research has investigated in detail the complex network of chemical, viral, and (epi)genetic factors associated with oral carcinogenesis. However, the causal factors that trigger the oral carcinogenesis process and the molecular mechanisms that underlie the tumor progression, and metastasis of OC have not been clarified. The present study analyses the hypothesis that immune reactions following viral infections may crossreact with tumor suppressor action proteins involved in OC. 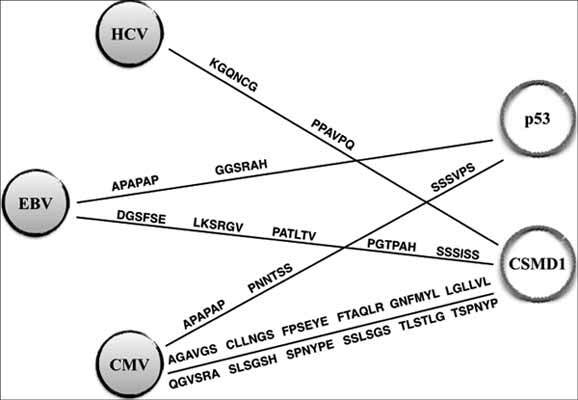 Using proteome databases and epitope catalogue resources together with data derived from an ample scientific-clinical literature, potential peptide crossreactions between HCV, HPV16, EBV, and CMV pathogens and human p53 and CSMD tumor suppressor proteins are detailed. The present study might contribute to understand the molecular basis of oral carcinogenesis and open new therapeutic research perspectives.